Loose railings should be properly secured for safety reasons. Railings around staircases should be no less than 36" (900 mm) high while the minimum height for balcony railings is 42" (1.05 m). 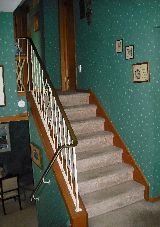 Stair handrails are required for all stairs with three or more risers. Loose handrails are dangerous and should be properly secured. To be effective, handrails should be installed at the right height which is 32-36 inches (800-900 mm). Straight Stairs. Spiral stairs. Handrails. Railings. Landings. Stairs. Stairway, stairwell, flight of stairs or just stairs are all names for a structure that bridges the gap between floor levels of different elevations. Stairs may be straight, spiral, or may consist of two or more straight pieces connected at angles by means of landings. For safety reasons, stairs have to have certain measurements in order for people to comfortably use them. Building codes will typically specify certain measurements for tread length, riser height and nosing protrusion to ensure hat the stairs are not too steep or narrow. The code also regulates the height of the handrail and diameter, maximum space between the balusters, number of steps for each section, etc. Spiral stairs. 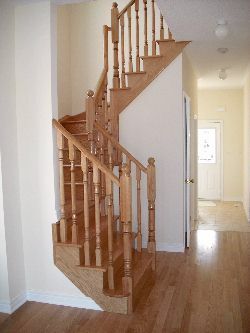 A tight spiral stair with a central pole is very space efficient in the use of floor area. A user of these stairs must take care to not step too close to the central pole as it becomes more likely that one or more steps may be missed, especially when going down. Using the handrail will also direct the user to the safer outer portion of the treads. Landings. Most modern stairs incorporate at least one landing. "L" shaped stairways have one landing and usually change in direction by 90 degrees. "U" shaped stairs may employ a single wider landing for a change in direction of 180 degrees. Though the landings consume more floor space, there is no requirement for a large single dimension, allowing more flexible floor plan designs. There is also a safety aspect to landings. It can shorten a fall down the stairs and it can provide a place to rest. Spandrel. The triangular space underneath the stairs is called a "spandrel". It is frequently used as a closet. Exterior stairs for fire escapes have very strict building code requirements to make sure they are safe for use. The condition of these stairs, whether they are constructed of steel or wood, should be checked regularly. As a building inspector I have seen numerous fire escape that failed the test due to the onslaught of wood rot and rust.